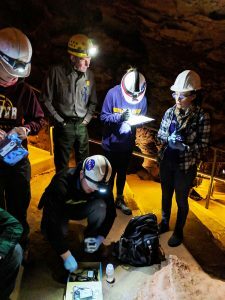 Fifteen students and two faculty members from the University of Northern Iowa, along with Dr. Morgan Cable, a NASA astrobiologist, had the opportunity to travel inside Wind Cave National Park, South Dakota for their spring break for a simulated astrobiological field research expedition as part of a hands-on field chemistry course. This field trip, partially funded by the Iowa Space Grant Consortium, was meant for the undergraduate students to learn what an astrobiologist may endure while field sampling in potentially extreme environments. The students operated many instruments including Geiger Counters, an X-Ray Fluorescence and smart phone microscopes to study the structures inside the cave. Along with learning how to use these instruments under field conditions, the students’ research results will provide the park staff with new information about the cave. Dr. Cable provided advanced support for the students from her extensive knowledge in comparing extreme environments on Earth to other areas in the solar system where life may be found. Extreme environments like the Wind Cave, help scientists better understand the limits of life and its relations to space. The class will be sharing their experience and initial results with the public at the 131 Iowa Academy of Science Meeting on April 26, at the University of Northern Iowa.